Cluedo Video Slot Review - Casino Answers! 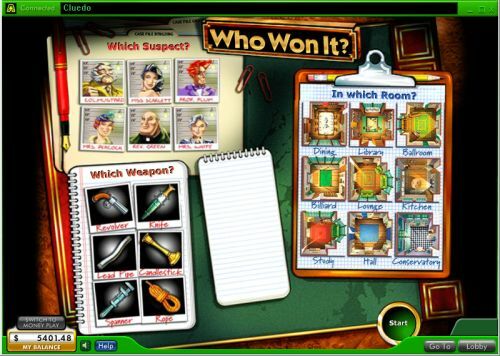 Cluedo is a 5-reel, 15-line video slot developed by IGT and found at Random Logic casinos, featuring a wild symbol and a bonus game. You can play the Cluedo video slot at Bovada. 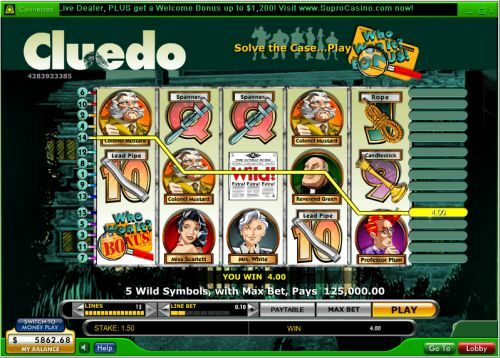 Bets on the Cluedo slot machine are $0.05, $0.10, $0.25, $0.50, $1, $2, $5 and $10 per line. You can select 1-15 paylines per spin. You can bet anywhere from a nickel per spin up to $150 per spin on the Cluedo nickel slot. Cluedo has a good betting range that is suitable for casual players and high rollers. You can press “Max Bet” to select all 15 paylines. To play the Cluedo video slot, select your bet and press the “Play” button. The highest paying symbol on the Cluedo video slot is the Cluedo symbol. If you hit 5 Cluedo symbols on an active payline, you will win the 12,500 coin top jackpot. The second highest paying symbol is the Miss Scarlett symbol, which will pay up to 1000 coins. Cluedo’s wild symbol is the Newspaper symbol. The Newspaper symbol will substitute for all symbols except for the Who Who It bonus symbol. If you land 5 wild symbols on a payline, you will also win the 12,500 coin top payout. All wins pay left to right. All payline wins are multiplied by the bet per line. The wild symbol will substitute for all symbols in Cluedo except for the bonus symbol. Cluedo is a decent enough video slot, but we can’t help but think it could be better. We have seen bonus games on similar mystery video slots done so much better, such as on the Mystery at the Mansion video slot. It also lacks any special features beyond a wild symbol and a bonus game. On the plus side, it has a great top payout! You can play the Cluedo video slot when you sign up and make a deposit at Bovada. Can USA players play the Cluedo slot game for real money? No, American players cannot play Cluedo for real money at this time. For an alternative, we recommend you read our Moonlight Mystery Video Slot Review or play it at Bovada. Can I play a free flash game of the Cluedo online slot game? Yes, an Instant Play version of the Cluedo slot machine is available at 888 Casino. You can play for free or real money. If you have any issues with the flash casino, we recommend that you download the latest version of Adobe Flash Player.